With the highest standards of quality and commodities offered, you're sure to enjoy your stay with us. 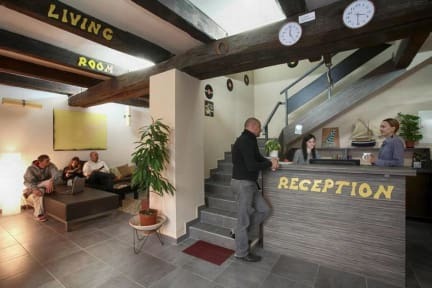 Our contemporary hostel is suitable for all kinds of travelers and our staff's familiarity with the city and Croatia will help you find activities suited to your tastes and interests, as well as recommend hidden treasures of the beautiful city of Zagreb. We have different type of rooms with comfortable beds and air conditioning, nice bathrooms (each with high-pressure hot showers), big common room, fully equipped bar with cheap drinks, outdoor terrace,laundry service, 24 hour reception, free Internet and Wi-Fi. Our facilities also include free lockers and free bed linen. Our contemporary hostel is suitable for all kinds of travelers and our staff's familiarity with the city and Croatia will help you find activities suited to your tastes and interests, as well as recommend hidden treasures of the beautiful city of Zagreb. We have different type of rooms with comfortable beds and air conditioning, nice bathrooms (each with high-pressure hot showers), big common room, fully equipped bar with cheap drinks, outdoor terrace,laundry service, 24 hour reception, free Internet and Wi-Fi. Our facilities also include free lockers and free bed linen. Rapporto qualità prezzo molto buono peccato che al secondo piano il corridoio era invivibile per l'umidità. Però consigliatissimo.